Lee is an amazing volunteer for our rescue He has seen first hand what the rescue does on a daily basis to help German Shepherds find new homes. He has helped pull them out of dire situations and he has worked tirelessly to help them over their anxieties. We are a volunteer charity so all our pennies are given by you the general public. Without your support, we wouldn't be able to do the work that we do. 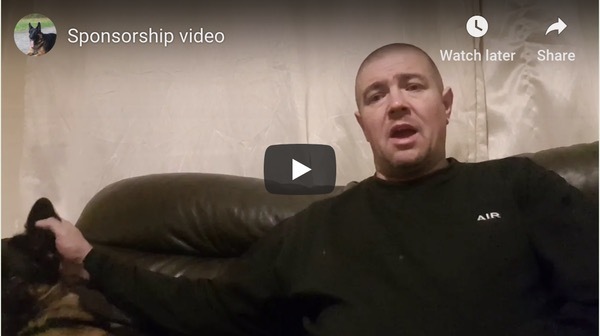 Now Lee has decided that he wants to do something absolutely ridiculous to raise money that will help save more dogs and enable us to continue the work that we do., to bring them out of horrendous situations and give them hope of a happy life in a loving home. So he chose to do the toughest mudder in the Midlands in May next year....8 hours overnight of sheer hell.. Please help us raise as much money as possible. Every penny donated through the Gofundme page will go to the charity. Any amount no matter how small will help. The rescue will be eternally grateful and Lee will be totally exhausted !! Ted came into the rescue in a terrible state, he was covered in fleas and had terrible chronic ear infections which caused him great pain and discomfort. He has just had a total ear canal ablation on his left ear and may need his other ear doing. 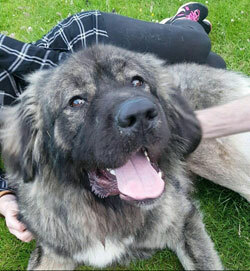 Ted is currently in foster but they can no longer keep him so if we can't find another foster home Ted will have to go into kennels which would be a disaster for him as he needs a home where he can convalesce and continue with his treatment. Ted currently lives with a female staffie with whom he is fine but he can be reactive to other dogs outside. Ted needs a quiet home with experienced people and no children. More about our lovely gent Ted. A few weeks ago, these two beautiful dogs were found tied to a park bench in London, abandoned by their owner who has never been found. 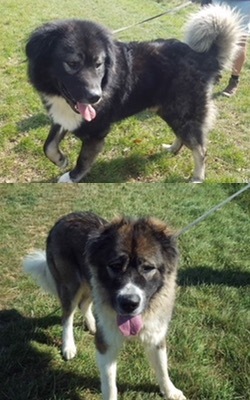 Fortunately, the relevant authorities were kind to them, picked them up and they spent 7 days in the pound before coming to GSDR to find their forever homes. Kiz is a lovely affectionate, bouncy, young girl who doesn't seem at all traumatised by her experience. Olan is also a lovely boy but he is more true to the Caucasian characteristics and is protective especially of Kiz. He is also food possessive so will need an experienced home without young children. Although they love each other they are not dependent on each other and as it is difficult to find homes for pairs, realistically we will have to split them. Ideal homes for either of these two would be more rural and with at least a very large secured garden or land. Could you give Olan or Kiz the home they so deserve? 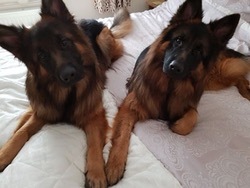 Blaise and Yogi Bag Themselves a Home Together. From their adopters: Please meet our 2 boys we have had them since the beginning of Oct 2018. They are brothers and are age 2. They have come on in leaps and bounds, we could not get a collar and leads on them when we first met them, they are better now, one of them still has to try and eat the collar first. We have had a few issues and still have one or two things to iron out, but we will get there with time and patience. We had a trainer to give us some help and tips, even though we have had GSD's for 37 years we still needed advice. They had no basic training etc, I take them to a secure field a few times a week and train. They just love to work, their reward a ball and they only get it when they do what is asked. They have been to the doggy spa and bit nervous to start but loved it. We go out twice a week with a dog walking group to help socialise them, especially the one, as he is very vocal and has little dog syndrome. If you are reading this and are in two minds whether to adopt or not, my advice is to do it, yes you will have issues, you need lots of patience, and don't expect miracles to happen overnight. Rescue dogs are not damaged dogs; they have just been let down by humans. It should not matter what colour, size or age they are - that is not rescuing. Dogs like these deserve a chance, not jail!! Can you free a dog from kennels and give him or her a kind loving home? If you can help, please fill out an adoption/foster form. These are some of our kennel dwellers. Although we are a German Shepherd Dog rescue, there does not seem to be an official Caucasian Shepherd Rescue here in the UK, so since 2013, we have been helping these dogs find homes and have built up a good knowledge of this breed. Most of these dogs are finding their way into the UK through unscrupulous breeders in eastern Europe or coming in via questionable rescuers with no rescue back up here in the UK. Most that we have helped so far, have been picked up as strays here in the UK. This is certainly not the breed for everyone and if you are considering owning a Caucasian Ovcharka, please make sure that you thoroughly research the breed first. They may be the cutest bundles of fluff imaginable as puppies but they are a giant breed and will grow into a very large immensely powerful dog. Caucasian Shepherds that we have for rehoming. 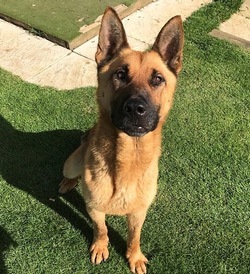 This handsome boy is Cesar, a 3-year-old, neutered, male GSD who was found straying and spent a year in kennels abroad before coming to the Uk to try to find his forever home. He has obviously been somebodies pet previously as he knows commands and has been trained. He arrived very skinny but has put weight on since being here. He is very friendly with people but will need to be rehomed as the only dog and will require somebody who has experience of the breed. He isn’t suitable to live with cats as he will chase and due to his food snatching tendencies he is best housed with teenagers and upwards. Cesar is a handsome lad with a drive to please. With someone interested in dog sports such as agility he could prove to be a fun dog to work with. He is intelligent and would love a home that will use that. Highlights - Huge thanks to BAGSD Leeds and special thanks to Tom and Jean who dropped off a cheque for £1059.11. 29th 30th June 2019 - Join us for a weekend of fun at Copmanthorpe Kennels, York. YO23 3TL. Help us break last years record of 93 GSD;'s in one place. Join us for a weekend of GSD fun and games to include a fun dog show, K9 games, raffle and tombola on Saturday daytime then in the evening meet up around the bonfire for drinks and takeaway. Camping available. Our volunteers are dealing with ever more difficult situations particularly unrealistic expectations from adopters who are rejecting dogs sometimes as soon as 24 hours after picking the dog up. The poor dog doesn't even get a chance to unpack his or her bags before we have the adopter screaming down the phone at us demanding the dog be picked up. We produce guidelines for adopters giving advice on settling your new family member into the home but it helps if adopters actually read them. Rescue dogs are not damaged dogs, they have often been let down by humans and need more than 24 hours or even a few days to settle into their new home. You don't really get to see the real dog until about 2 weeks after adoption so people need to be a little more understanding and patient. Rejecting a new dog is very damaging and unsettling for them it also makes them become less trusting of humans and more difficult for us to rehome. Pull up a chair, grab yourself a coffee and enjoy our latest newsletter. 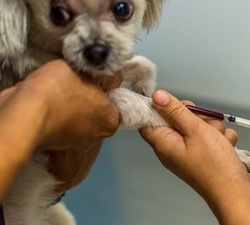 Just to put things in perspective, the animal vaccine industry has been valued at $6.27 billion in 2015 and, at a calculated annual growth rate of 6.9 per cent, it is expected to rise to $11.40 billion by 2024. So vaccines are a very lucrative business indeed and if you think they are really concerned about your pet's health, think again as this is nothing more than lining the pockets of big Pharma and vets. As a rescue, we have seen the lifespan of GSD's reduce by a third in the last 30 years as well as seeing big increases in behavioural problems such as aggression. Over 50% of dogs are now getting cancer which is an entirely manmade disease with hemangiosarcoma the number 1 killer. GSD's are particularly prone to vaccine damage and we see an ever-increasing number of dogs with autoimmune diseases especially skin disorders, persistent ear problems and sensitivities to foods. Please educate yourselves and at least stop yearly vaccinations which are making your dogs sick and shortening their lives. This is evidence backed, here is the scientific research into vaccine-induced autism in dogs. GSDR always has and always will operate a NO DESTRUCTION POLICY because we believe that all dogs deserve a good life. We will find the right home for all the dogs that come into our care no matter how long it takes. German Shepherd Dog Rescue is both a registered charity and company, which produces yearly accounts so that you know where your donated monies are spent. We are German Shepherd Dog Rescue the biggest and best charity in England and Wales helping to foster and rehome German Shepherd puppies and German Shepherd dogs (Alsatians). 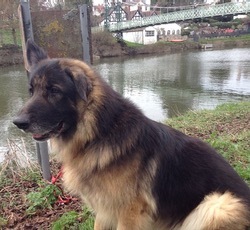 German Shepherd Dog Rescue helps rehome German Shepherds across the UK. Can you help us raise funds so that we can rescue more unwanted German Shepherd Dogs? If you are thinking of buying a dog as a family pet forget that puppies for sale advert, please read this article first. Please do not contact the rescue specifically for puppies - buying a puppy. We are looking for loving homes for rescue dogs of all ages. We always have many German Shepherd dogs for rehoming. Can you offer to adopt a German Shepherd and give it a good home or maybe you could foster a German Shepherd until a new home can be found. If you would like us to feature a German Shepherd dog that is looking for a new home, please contact us with your details. Please note that this is a genuine service for German Shepherd Rescue and not a listing for people wishing to sell their German Shepherd dog. We do not have puppies for sale or dogs for sale but we do ask for a minimum donation which goes towards helping other needy dogs. Monies raised go towards kenneling and veterinary costs. German Shepherd Dog Rescue is run by volunteers who are involved because of their love for the breed. Most have jobs and families and fit in rescue work when they can and at their own cost. Please be patient, and we will deal with your requests as soon as we can. Our rescue dogs are worth waiting for! Please help us by donating so that we can help re-home more unwanted German Shepherd dogs. 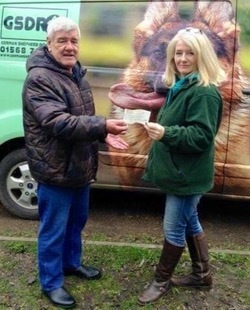 Donations can be sent to Jayne Shenstone, German Shepherd Dog Rescue, Little Vauld, Marden Hereford HR1 3HA. We also accept Paypal payments - just click on the Paypal button below. Thank you.